I recently discovered an easy trick to save money on retail purchases with the app Paribus. I joined up with the service early this January and once enrolled, pretty much forgot about it until I got my first notification that I’d received money back…a mere 10 days after I signed up. 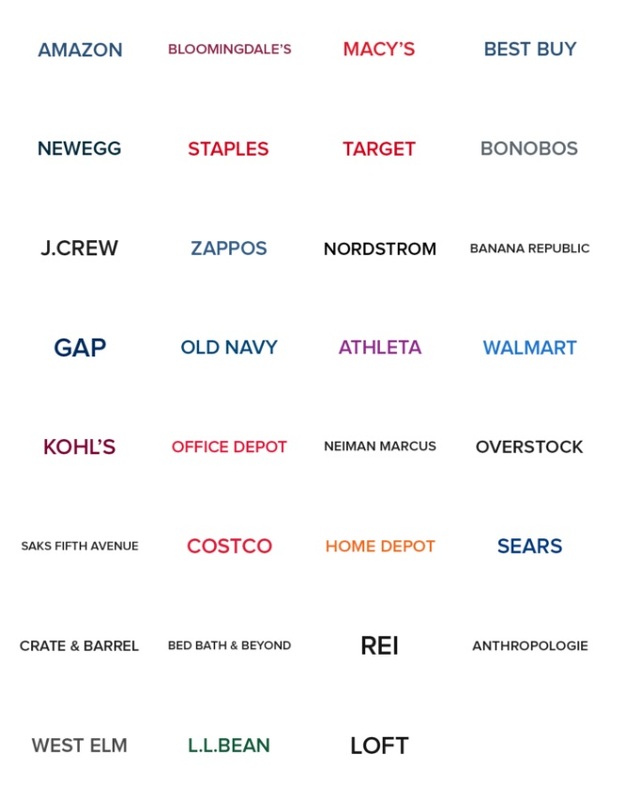 If you shop the stores below and don’t mind forgoing a bit of privacy, signing up for this service could be well worth your time. Sign up! If you use this referral link, both you and I will receive an additional 5% back on all purchases. NOTE: Paribus keeps 25% of the money it saves for you. This 25% can be reduced to 0% through the use of referral links. The 25% finders fee is waived for the first refund they find you! Register the credit card(s) that you use to make purchases. NOTE: At the time I registered, a Citibank card did not qualify but my Chase card did. Register the email(s) where your purchase receipts are delivered. That’s it! No more checking back to see if you should request a price adjustment. Which hardly anyone does anyway. Just wait until you start getting notifications of savings! 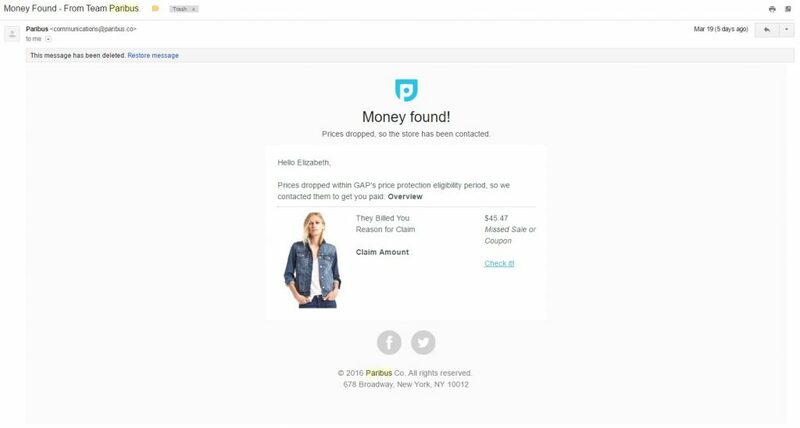 Once you’ve registered, Paribus will automatically scan your emails/credit cards for purchases made through the participating companies. 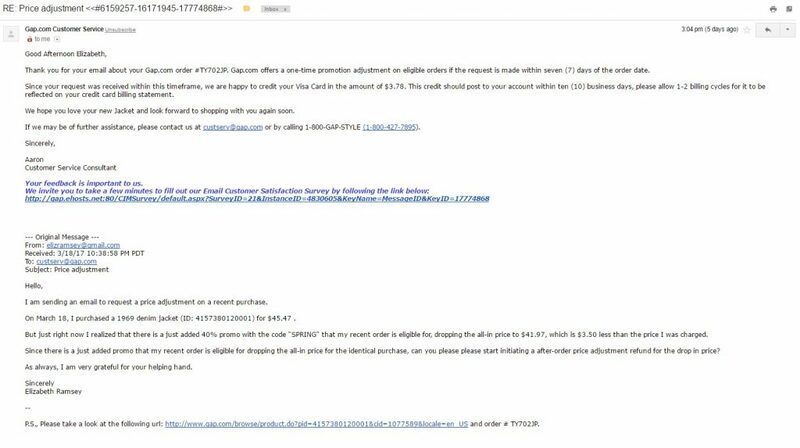 When it finds a product that drops in price within the allotted time (which ranges from 7-90 days depending on the company), you will receive an email like the one below. These are my actual email notifications from a purchase last week. I was looking to replace a wardrobe staple – a jean jacket – for spring and came across this Gap one that was at 35% off with promo code. Later that week, Paribus caught that a more attractive, 40% off promo was running. They sent an email to the retailer requesting a price adjustment on my behalf and the next thing you know, I’ve got $4 back! Not a ton, but not bad for one small purchase and even these small wins add up over time. Imagine the potential for larger purchases or if you are a very frequent shopper!